Ripples dips a toe into solar electricity, prepares to take the plunge. We’ve started learning the basic components of a solar panel and got to admire some panels “close up” on the roof of our friend Troy’s house. It’s sweltering in August, which makes it a good time to start considering how to harvest all that brain-baking power. This week’s issue of the Free Weekly includes a Making Ripples column all about getting motivated to make the switch. 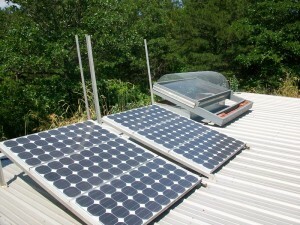 Members of Save the Ozarks are seriously motivated and have begun helping Eureka Springs transition to solar energy. Check out the work they’re doing to stop SWEPCO from adding a high voltage power line through sensitive karst areas, private land and historic locations such as Thorncrown Chapel. There are many options for alternative energy and resource conservation; solar power is just one good option. If you’d like to consider it for your house, check out these local Northwest Arkansas companies that can help!